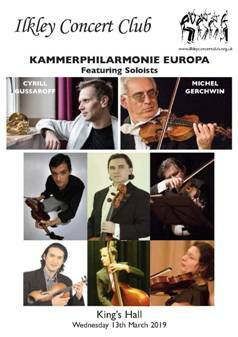 Kammerphilharmonie Europa or Chamber Philharmonic of Europe returns to Ilkley for a second visit. 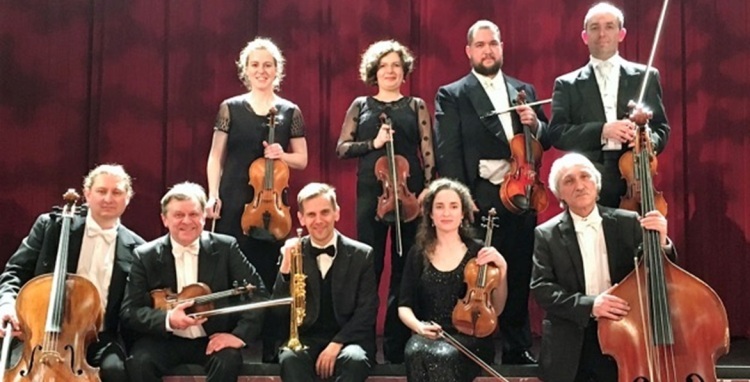 Founded in Cologne in 2006 by Russian-born Leonid Tritus, this 60 strong orchestra brings to Ilkley 10 musicians from various European countries to entertain us with baroque and classical repertoire. As well as Bach’s well-known E major violin concerto and an Albinoni violin concerto arranged for the trumpet, we will hear the even better-known Adagio in G minor, which is probably not by Albinoni. As a contrast the Kammerphilharmonie will play two delightful student works for strings from the late nineteenth century by the Danish Carl Nielsen and the Czech Josef Suk, who was taught by Dvorak and eventually became his son-in-law. On Wednesday Ilkley Concert Club members gave a warm welcome to a return visit from the Kammerphilharmonie Europa. Although these talented players are in the middle of a tour embracing twenty concerts in as many days, in no way did this seem like a routine performance. The four violinists together with viola, cello and bass that make up the nucleus of the orchestra played with consummate artistry and ensemble in some challenging repertoire. The Vivaldi concerto that started the concert demonstrated the excellence of the string playing, vigorous in attack in the outer Allegros and with suitably restrained legato lines in the central Largo. Cyrill Gussaroff (trumpet) gave a fine performance of Albinoni’s Concerto Saint Marc, displaying both a smooth tone and virtuoso agility, but challenging the rhythmic ensemble in places. The delight of the evening was Josef Suk’s Serenade for strings which followed, full of charming echoes of his teacher Dvořák, but with a contrasting touch of melancholy. Here the lower strings, and notably the rich-toned viola playing of Laurent Tardat, came into their own, particularly in the central Adagio, the emotional heart of the work. The second half commenced with a nicely judged performance of the Bach E major violin concerto from Michel Gerchwin, the concertmaster. The beautifully decorated solo line emerged, as it should, from the surrounding ripieno rather than dominating the sound and, in the slow movement, had pathos without self-indulgence. The Kammerphilharmonie followed with Albinoni’s Adagio and succeeded in making this over-familiar piece seem fresh and new-minted. The finale, Nielsen’s early Little Suite for strings – showing some of his future individuality without any monumentality – received a skillful and playful performance. The vigorous applause from the packed auditorium called forth two delightful encores – an agile performance by Gussaroff of Dinicu’s Hora Toccata, made famous by Heifetz, and a crowd-pleasing mash-up in which the Eine kleine Nachtmusik embraced everything from Beethoven to the Beatles! A very refreshing disc of Vivaldi Concertos “The French Connection” includes tonight’s work, and is performed by La Serenissima conducted by Adrian Chandler on Avie AV 2178 (full price). A medium price alternative of Vivaldi’s String Concertos comes from Accademia i Filarmonici conducted by Alberto Martini on Naxos 8.553742. There have been several recordings of this Trumpet Concerto, but none seem to be currently available, although those by Berinbaum or Maurice André may be available on-line. The famous Adagio is available at budget price from the excellent Il Giardino Armonico on Erato 9029698516. Works by Bach, Purcell, Telemann, etc. complete the CD. A very pleasing CD at medium price from Naxos 8.550419 includes the Dvorák String Serenade, and is performed by the Capella Istropolitana conducted by Jaroslav Krenek. An interesting new recording, with excellent reviews, comes from Warner Classics 0190295633875 (full price). Shunske Sato (violin) with Il Pomo d’Oro conducted by Zefira Valova give very refreshing performances of 4 Bach Violin Concertos. A lovely recording of this charming work is included on a budget CD of Nielsen’s music, mainly for the theatre, on Alto ALC 1306. The Odense S.O. is conducted by Tamás Vetö.